In large dry skillet, toast oats 1 cup at a time until brown. They are done when you can smell them. Toss them frequently to avoid burning. Put toasted oats in bowl to cool then toast the other cup. In large bowl add turkey. Chop onion and add to bowl. Add cheese, egg salt and pepper. In food processor or blender, chop oats until they are like flour. Add the parsley and chop until seasoned. Add to bowl. With clean hands, mix the meatball mixture until fully blended. Line a baking pan with foil. Drizzle Extra Virgin Olive Oil on bottom. With a tablespoon or cookie scoop, evenly scoop about 24 balls and place them in the pan. In a small bowl add about ¼ cup oil. Using fingers from one hand, rub som oil on the other palm then repeat with the other hand. Roll three balls, reapply oil and repeat until done. Broil until brown on one side, flip being careful not to break them and brown on the other side. Remove into a bowl and repeat the cooking steps with the remaining meatball mixture. Meanwhile, in large sauce pot, sauté onions until translucent then add garlic. 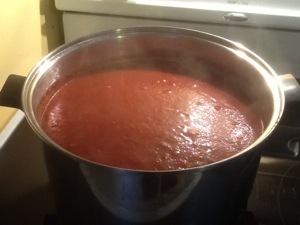 Add red wine and turn heat to high and stir until wine is reduced by more than half. Add tomatoes, seasoning and salt and pepper. Reduce heat to low, stirring every few minutes. 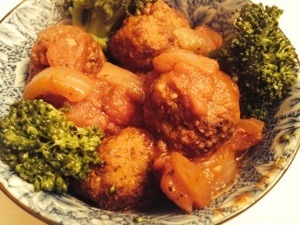 After second batch of meatballs are cooked, remove them to the bowl then gently add meatballs into sauce. Stir carefully and heat through for 10 minutes. Serve over broccoli or whole wheat pasta. When I had the honor of singing the US and Canadian national anthems at Toronto’s Skydome (before Rogers amassed their billions for the naming rights) I met a woman who was to throw the first pitch. Prior to the game all of the pre game folks rehearse according to a carefully prepared and timed script. She had to go to the mound…or many feet in front of the mound and practice throwing to the catcher. Wow, that’s hard. I was impressed she got it even near the plate. She said she had been throwing the ball to her husband for weeks to practice. When it was my turn to practice they cued my tape and I (shudder, yes, I lip synced) sang the anthems with all my heart into a dead mic. Easy peazy lemon squeezy. “Um…I sing most often in church and I am decidedly not famous.” But, she was not buying it one bit. Not famous? Not possible. She kept at it. “How often do you sing the national anthem?” At that point I had sung for the Sabres a few times and sang at what is now Progressive Field in Cleveland for the Indians. Of course I was famous, or so she believed. When she gushed again she declared my life must be so glamorous. By then I didn’t have the heart to tell her differently since she already didn’t believe me. Even today, whenever I clean my bathroom I think of first pitch lady and the glamour of my life. Travel is glamorous. Traveling is not. I write this from a hotel room in North Carolina at about 12:30 AM. A ten and a half hour journey took nearly fifteen hours today. Apparently God picked Florida up by the Keys and shook it like a rug, flicking everyone without a Florida zip code back to the northern state where they belonged. I’m convinced that the only people left are the senior citizens and the food service folks who serve them their early bird specials. It took 3 1/2 hours to drive through South Carolina and those that were not in their cars in post holiday gridlock were eating at the Cracker Barrel. No lie, my mom and I had to wait 20 minutes for a table at 9 PM. Thank God they have biscuits. And sweet tea. And grits. But the trip was worth everything we experienced today because my family was mostly together last weekend (missing a nephew and family who stayed back home and a niece who was traveling through Italy). Cousins got to make new memories, siblings and parents played Monopoly and 500 Rummy and I got to cook. 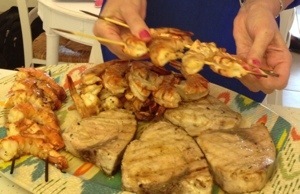 My sister and I prepared our annual seafood feast on Good Friday. The kids actually look forward to it and I don’t think we disappointed anyone. It is a hefty investment but worth the expense and time. We really kept it simple this year with only one hot side (my orzo with roasted grape tomatoes) and a “nice” salad. Our cousin brought a really cool bread bowl and cupcakes. We had a great evening. Here is a quick trick for grilled shrimp: marinate them with the shells on with lemon, lots of garlic and good olive oil. Get your grill screaming hot. Instead of just one skewer, use two to create some stability. Cook each side for only a few minutes until just pink. One of the highlights of my trip was dinner at the Chart House in Fort Lauderdale. The dinner was as good as the view. There are many of these restaurants across the country. Each one has a view of the water. My favorite is in Dana Point, California. If you ever have the chance, I highly recommend it. It will be a special dinner so be prepared for a pricey a la carte menu. From Thursday through Monday we had nine people living in a two bedroom condo. Close! But I wouldn’t trade the joy on my mother’s face when she saw an entire pew filled with her family on Easter Sunday. No, traveling is not glamorous, but well worth the effort knowing we once again made memories of a lifetime. 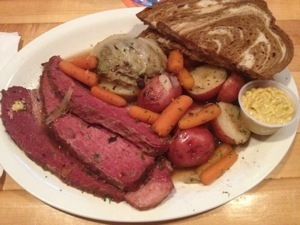 It was the very best corned beef and cabbage I have ever had. All they would tell me is that it was beer, sugar and pickling spices. There was a decided clove/cinnamon/nutmeg flavor…so delicious! Made me forget it was Monday and I didn’t order their famous mac and cheese. 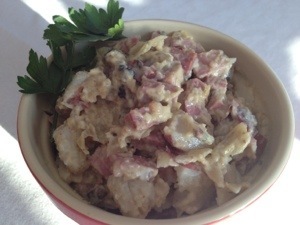 Chopped up all the leftover corned beef, cabbage, carrots and red skinned potatoes. Added some of the spicy mustard and mayonnaise. 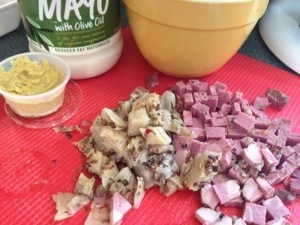 Corned Beef and Cabbage Salad Bowl.